With green being the new black in fashion these days, the words "eco-friendly", "sustainable" and "natural" are no longer associated with granola-crunching hippies. In fact, it's been hip to be square if you know what I mean. Quite common to see H&M selling clothes made of organic cotton, and clothing labels like Edun and Loomstate building a business while at the same time making socially conscious fashion statements. Of course, you've all heard about Anya Hindmarch's famous tote, and while not everyone got to get their hands on one, one great thing that has come out of it is that it has raised awareness about the need to cut back on (if not totally eliminate) the use of plastic bags. And really, there's no need to feel like you missed out if you did. Because there are plenty of eco-friendly bags available out there. Thanks to Jin (McDreamer) and Ruby (Schushop) who gushed about this bag, I "discovered" this gorgeous tote from Aranaz! This canvas shopping bag has leather handles and metal rivets (for extra strength!) and a wooden "I'm a Natural Shopper" plaque on the outside (cute huh!). If you want to see it up close, click here and see it on Daphne's Flickr site. According to bag designer Amina, "Our family (the Aranaz family) tries as much as possible to live the all-natural way! As much as possible, we try to avoid the usage of chemicals and other toxic materials in our everyday life. (eg: We use coconut oil based body soap, avoid food with preservatives and usage of strong chemicals in our home, we first treat sickness through natural means, etc.) Thus, the "ARANAZ I'm A Natural Shopper bag" is our effort to contribute to the worldwide campaign of promoting all-natural and eco-friendly living." Now isn't it time for you to do your share as well? Get one or two, I mean you can never have too many shopping bags right? 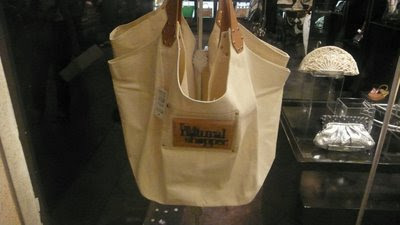 This tote is available at the Power Plant Mall store for P750, P200 of which will go to an environmental foundation. Quite ironic she should say that when they are also selling a couple of clear PLASTIC handbags at their store.